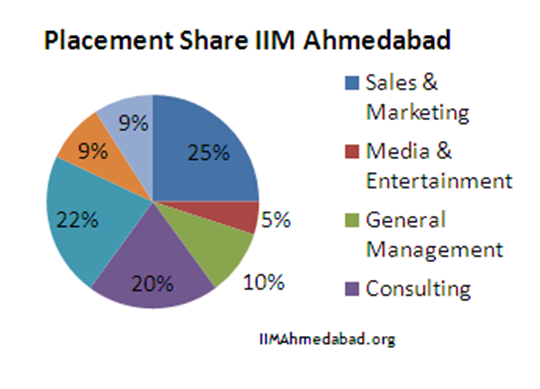 The Indian Institute of Management (IIM), Ahmadabad completed its final year placement process earlier this week. The Institute provides to more than 270 students from the final year of class 2010. The institute gives the securing jobs to the students. The students receive their dream job with higher paying skills very earlier this week. More than 110 firms participated in the job fair of final year placement process in INDIAN INSTITUTE OF MANAGEMENT (IIM).Ahmedabad.This year the ICICI bank and YES bank recruiters the largest number of students of IIM,Ahmedabad. Firms like Deloitte Consulting, A&M, Yes Bank, TSMG, Cognizant, Aditya Birla Group, Amazon and Philips were some of the major recruiters during the process.According to the information of Press Release of IIM Ahmedabad,more than 40 firms participated in the placement process and extended more than 100 offers,an increase of 4 times over last year. According to the data provided by the Institute,89 students have offered the secured jobs through the lateral channel or received a Pre-Placement offer.Five people opt to start their own ventures,while four opted out of the process,claims the institute. The average salary of students offered in INDIA was 14.94 lakhs,while the salary offered to the students who will work in the foreign country was US$ 110,750.The salary offered to the students of the foreign country is equivalent to earning about Rs. 18.1 lakh in india(according to the prices of January 2010 and using the principle of the Economist’s).